1 How to choose the Best Sewing Machine with Embroidery? Having the best sewing machine with embroidery is never an easy task but it is one that should be cherished nonetheless. You want to have the best embroidery machine that can get the job done whenever you need it. Three names stand out when it comes to both home and commercial machines namely - Brother, Singer, and Janome. While Brother and Singer are perfect for personal use, Janome is ideal for business and commercial purposes. Brother machines are known for their innovative and high-quality machines that are built with unparalleled software. They usually come loaded with accessories meaning you don't have to fork out an extra $100 to buy accessories that could be integral to the use of the machine. For beginners, it is usually advisable that you stick to the least complicated product on the market. This is due to the fact that complicated machines tend to come with a longer question, title of the lining. This resource is an in-depth guide trying to take a look at the best sewing machine with embroidery and what to look out for if you are currently considering a purchase from your local store. How to choose the Best Sewing Machine with Embroidery? Here a couple of things to consider before you decide to buy an embroidery machine. When it comes to choosing a quality sewing machine with embroidery, the brand name says a lot about the quality. Check the review of the product, as well as the manufacturer's blog to get a feeling of what customers are saying and how they resolve issues when they are raised by a buyer. Another thing to check is the dealer who is retailing the machine. You need a dealer that is enthusiastic who would respond to your query with passion. A good way to check for this is by looking into the Question and Answer section (on online retail stores) to see how quick the dealer responds to customer's queries. How do you plan to use the machine? Will it be for home use or business use? If you tend to use your machine for business purposes, there are machines built for commercial use which can be put to use for hours of operation without any hassle. Throat width refers to the amount of space between the needle and the machine body. A lot of the new sewing machine models have throat width that affords you more room to move, use larger hoops that is suitable for quilting of any kind. How will the designs be transferred and accessed? Earlier machines used floppy disks which allowed it to transfer data easily from the PC to the embroidery machine. We have also seen sewing machine that uses data cards. What you want is a sewing machine with embroidering that uses a USB connectivity with embroidery designs accessible directly through a USB cable to the computer. No one wants a machine that will break up months after purchasing it. Having a warranty for a product is very crucial in today's world. You should ask questions about the warranty to know what it entails. When the sewing machine breaks down, would you be required to pay for postage to have it repaired and fixed for you? A little bit of research is time well spent when you decide to buy a sewing machine with an embroidery system. If you are a lover of sewing and embroidery and on the search for great value for your money, you will find a list of great options here that you can’t help but choose from! The Brother SE400 is a combination sewing and embroidery machine and one of the best home embroidery machines on the market. This amazing product has a 4 x 4 embroidery area, a separate arm for embroidery and bright built-in light which makes sewing and embroidery a breeze in poorly lit places and is a useful feature for those with poor vision. The machine features an easy bobbin winding system and a LED touch- screen display which works hand in hand with the computer connectivity when you need to import designs from your computer. The great thing about this machine is the price you get for its incredible features. When you make use of its computer connectivity feature, you have unlimited access to several designs you want to sew or embroider, and it is a suitable machine choice for seasoned tailors/designers. Learning to use the Brother SE400 is not difficult. It comes with a very detailed manual, and all you need to do is to study the parts and the manual. Although, if you are a newbie learning the basics of sewing, this is not the machine for you. Its functions are easy to master, but for a beginner, it is impractical to spend so much on a machine just to learn the basics of sewing. Aside from the price of the product, it is not an all-purpose machine. It is advisable to buy a machine that suits your purpose. A beginner planning to use this machine would find it quite easy to handle with the help of its very detailed manual. The machine is capable of both sewing and embroidery which makes it very convenient and eliminates the cost of having to purchase a separate machine for either sewing or embroidery. The feature that enables computer connectivity is especially good, any ideas you might have or designs you can think of can easily be brought to life. 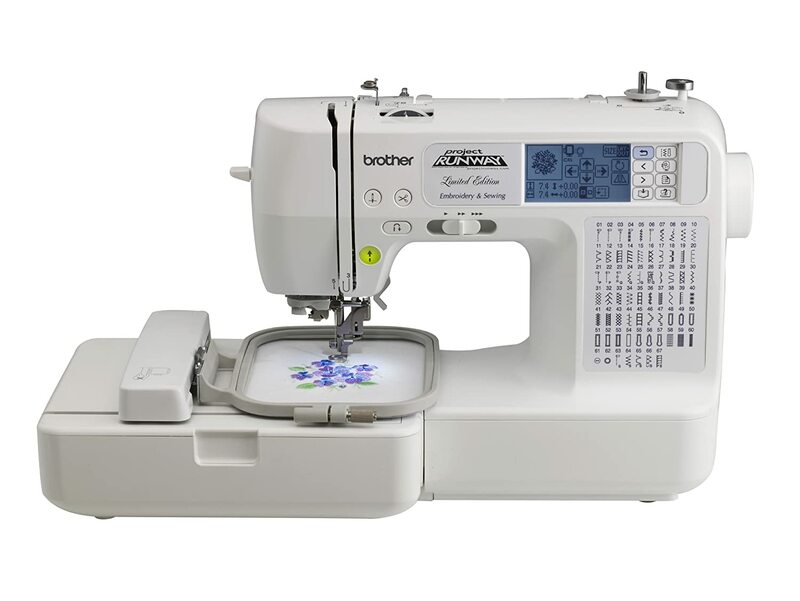 The Brother SE400 comes with 67 sewing stitch designs paired with 70 stitches for embroidery, and when connected to the connected, a user can decide to download or purchase more designs. The touchscreen LCD saves the time and trouble you would usually take to press buttons and spin the dialers. Threading the needle on the machine and winding the bobbin is completely hassle-free. The Brother SE400 comes at a reasonably affordable price for the features it possesses. Its features are user-friendly and accessible by both professionals and amateurs. 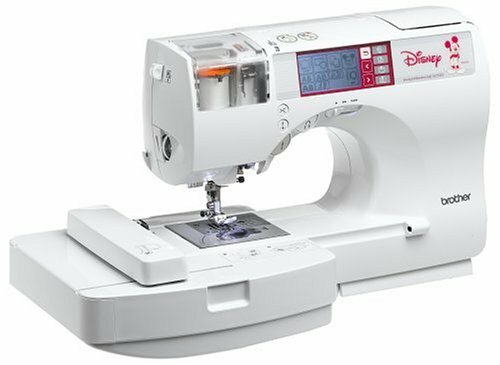 If you enjoy sewing and embroidery or you are simply a dabbler trying out a new hobby, you should consider purchasing the SE40. It comes with a computer connectivity that grants you access to the designs you want to embroider. The machine is quite heavy. The manual is quite detailed. It can only be used in places with 120 and 110 voltages. Its inbuilt light makes it ideal for those with poor vision. The Brother SE 400 is not ideal for newbies. This machine can sew and embroider at the same time. It’s LCD is easy to use, and it takes away the hassle of pressing buttons or spinning any dialer. The Brother SE350 is a sewing and embroidery machine fully equipped with high-end features that make sewing a much easier and enjoyable experience. The brand is one of the best on the market, and you can be sure you are getting good value for your money. The machine is sturdy and durable and comes with a variety of features. It gives you dual functionality at a reasonably affordable price. With the SE350 embroidery no longer has to be time-consuming or difficult. The machine is a computerized embroidery machine with a framing system that holds fabric tautly while the computer controls the needle to create a pattern on the fabric from a chosen digital embroidery pattern. This makes embroidery much faster and efficient. The machine weighs about twenty-four pounds and measures approximately 18 x 8 x 12 inches. The SE350 comes with LCD touch-screen for easy stitch selection and editing. The stitch performance of the machine is excellent, and it can be used to sew different materials such as clothing or curtains. It handles fabric quite well, so you don’t have to worry about it tearing up your fabric. The SE350 is a versatile machine and allows you to explore your interests and creativity. It is also a great choice for beginners and professionals alike. A quick study of the manual will help you get going without a hitch. Another great feature of the SE 350 is an automatic needle-threader with fifteen needle positions.The top-loading bobbin is easy to use, and winding bobbins can do quickly and efficiently. It has a maximum embroidery field of 4 x 4 inches and an automatic push-button thread cutter. The machine features sixty-seven built-in stitches and ninety-eight stitch functions with ten styles of one-step automatic buttonholes. The SE350 also comes equipped with seventy built-in embroidery designs, five monogramming fonts, and one-twenty frame pattern combinations. With the LCD for one-touch selection, embroidery becomes an even easier affair. The SE350 is an excellent machine for beginners. It is quite heavy. It can stitch different materials without any hassles, and it handles the fabrics well. Takes up too much space. The machine is sturdy and features a wide array of stitch styles. It has a limited embroidery field. It comes with seventy built-in embroidery styles and one-twenty frame combinations. It can perform both sewing and embroidery functions. This impressive model has features that will have you blown away. If sewing and embroidery is a serious affair for you, this is the machine of your dreams. The Project Runway machine comes with a variety of features that will suit your sewing and embroidery needs. With this machine, you go from sewing a beautiful item to embellishing it. If you are on the lookout for versatility, this machine comes with impressive sewing functions, a range of 67 built-in sewing stitches, the length and width of which are easily adjustable for up to 5mm and 7mm respectively and 4 x 4-inch embroidery design and editing. Features like the automatic needle threader and quick-set bobbin will make your task much easier and faster. The machine is sturdy and powerful enough to sew bulky fabric without much of a struggle. The computer connectivity is another stellar feature of the machine which enables you to upload your custom sewing and embroidery designs directly to the machine, enjoy possible future machine updates and import and purchase several other designs whenever you need to expand your ideas. The machine has a range of editing features and tutorials all accessible through the LCD touch-screen. The embroidery design options with 70 built-in designs,120 frame combinations and five lettering/monogramming fonts will help you to explore your creativity and bring out the budding designer in you. The machine comes equipped with a range of accessories to help you with your craft, they include the 7 specialty sewing feet, designer rolling bags, USB cable, embroidery bobbin thread, softcover, and varied styles of one-step automatic buttonholes. It also includes others like presser foot leveling button and foot pressure adjustment, needle-stop position control, electronic variable sewing speed to choose the sewing speed, an automatic reverse and reinforcement stitch, reliable easy threading of both top thread and bobbin for even consistent stitching plus a one-touch automatic thread cutter cuts your top and bobbin thread with ease. It also features a backlit, easy to view LCD touch-screen which is a bonus if you work in a poorly lit area or have poor vision. 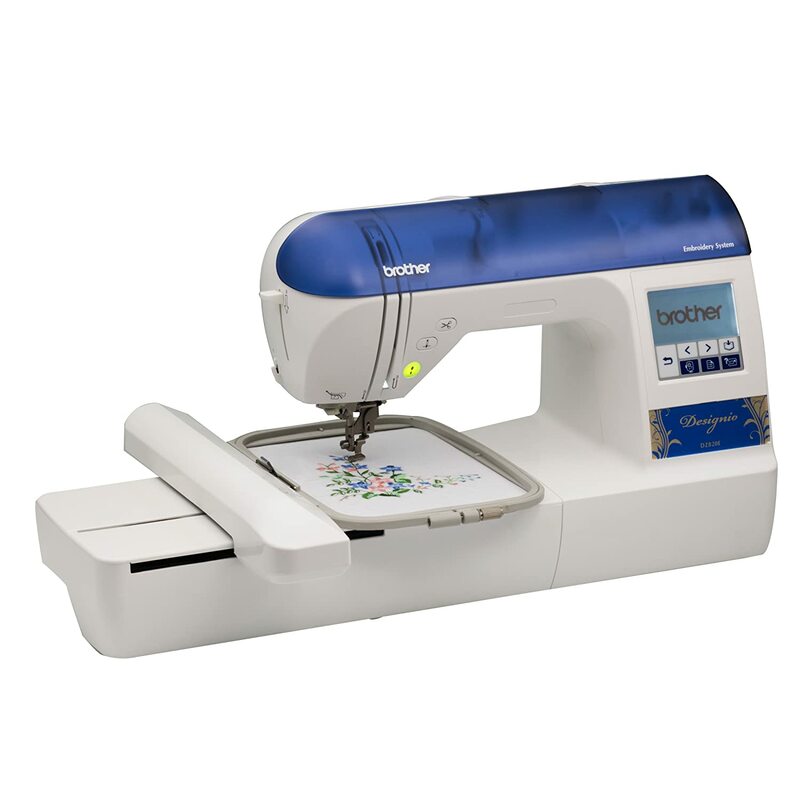 Dual functionality – sewing and embroidery functions rolled into one. The hoops that come with the machine are quite small and may not be suitable for large size embroidery projects. Computer connectivity. It is quite sensitive to thread type and quality. Ability to import designs from the internet. The LB6800PRW has a slightly small embroidery area. Easy to setup and use even for beginners. It includes a Project Runway custom fashion rolling bag. This combination sewing and embroidery machine promises the very best sewing experience a budding designer can hope for. 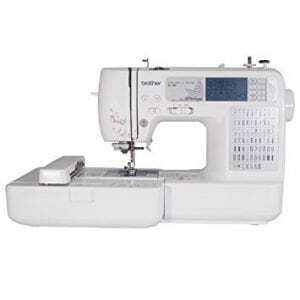 It comes with a range of features that make sewing and embroidery fast, professional and efficient. 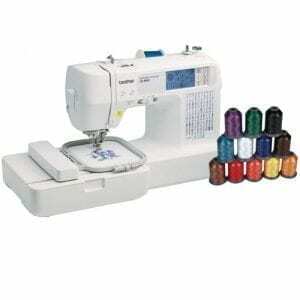 With the SE425, sewing, embroidery, quilting, and crafting are all made possible at a reasonably affordable price. The machine is durable, sturdy and built to last. It is reliable and easy to use, whether you are a novice or an expert. 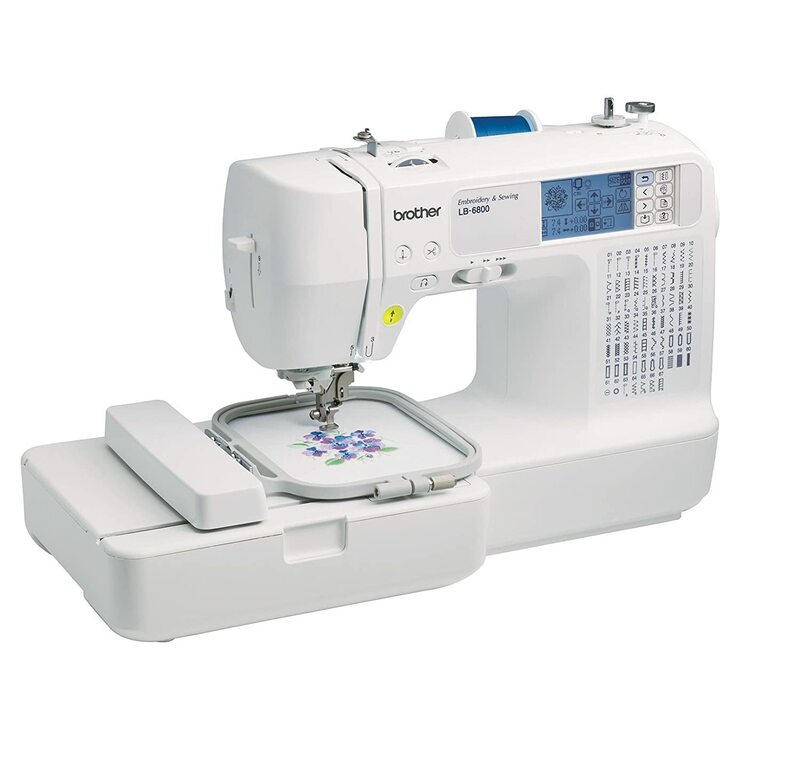 It provides a full range of sewing features, and incredible versatility with its 67 unique built-in stitches, ten one-step buttonholes, and a whopping 98 stitch functions. The SE425 includes seven quick-change sewing foot; buttonhole, overcasting, monogramming, zipper, blind stitch, button sewing and zigzag feet. Getting started with embroidery is a piece of cake, with the intuitive LCD screen display, built-in tutorials, quick start guide and instructional DVD. Choose from a variety 170 embroidery designs (70 built-in designs and 100 on CD), 120 frame combination patterns with five embroidery fonts. This machine has, even more, mind-blowing features including large, easy-to-view back-lit touch screen LCD which is a plus if you have to work in poorly lit environments or have poor sight. You can count on it's reliable, easy threading, with an automatic needle threader, it also features a Super easy bobbin winding system, a jam-resistant Quick-Set top drop-in bobbin, free arm for sewing cuffs and sleeves. The SE425 has a large 4" x 4" embroidery area. The design editing features of the machine can rotate, mirror-image, increase and decrease the size of your designs. One of its bests features is its Computer connectivity which can be used for importing designs and updating your machine. It also includes a USB cable, and with this, you can transfer your designs from computer to machine. The SE425 also features a built-in embroidery card slot, for use with optional Brother embroidery cards. It comes with built-in tutorials on the LCD which show how to use the SE425's sewing and embroidery functions, this also includes an Instructional DVD. Its operation manual helps you handle the machine with ease if you are not familiar with its functions. The SE425 comes with several accessories that make creating more fun than you can imagine. These accessories include a 4" x 4" embroidery hoop, an embroidery arm, a soft cover, a CD containing 100 additional embroidery designs, embroidery bobbin thread, Power cord and an accessory bag with seam ripper, needle set, cleaning brush, screwdrivers, touch pen, spool caps, scissors, bobbins. With the SE425, designing never seemed easier. Ease of use. The hoops that come with the machine are quite small and may not be suitable for professionals. 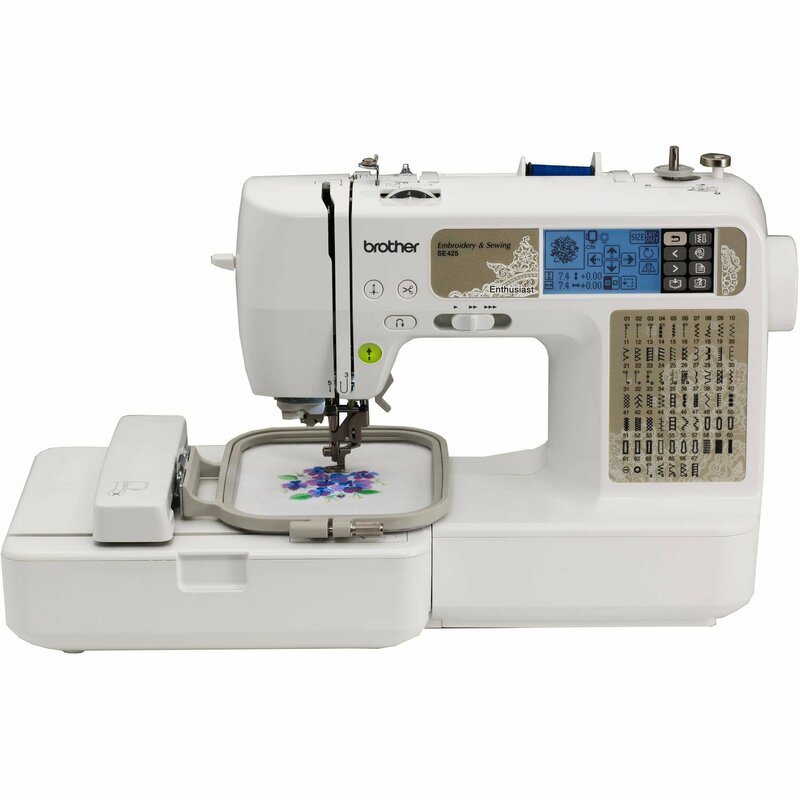 This machine is another great Brother product that combines sewing and embroidery. The LB-6800THRD offers you a variety of embroideries to choose from. It comes with a manual that is well-worded and is easy to follow which makes it great for beginners trying out the machine. It is completely computerized and boasts of numerous features and several accessories that make sewing and embroidery easy and enjoyable and also make it possible to achieve unique embroidery patterns you can think of. The machine is an excellent choice for delicate or intricate designs and projects. Like the SE400, it features a total of 67 stitches and 70 built-in embroidery pattern. Its computer connectivity enables you to hook up your machine to your computer and bring to life the designs previously created on your computer. Some of the accessories that come with this machine include an embroidery frame, needles, eight presser feet, bobbin clips an instructional CD and an operation manual. The machine can be easily stored away and covered with the vinyl cover that comes with the package. Embroidery field for the machine covers 4 x 4 inches, and the machine comes with editing features meaning you can edit your embroidery pattern on your screen or computer before you begin crafting. The machine operates with seven-point feed and an automatic push-button thread cutter. It also comes with an advanced needle threader and bright light which makes threading needles easier in the eyes especially in poorly lit areas or for persons with poor sight. The machine is very portable, durable and can operate for long periods. It can also handle a large amount of fabric at a time. The LB-6800THRD is very innovative and gives your product a high-quality finish. Computer connectivity. The thread wrapping around the spool pin might cause needles to break when trying to change them. Sewing and embroidery functions. It can’t do serging, and it can’t do designs larger than 4″ x 4″. Lots of design options and accessories. The DZ820E is an embroidery only machine that is modern, portable and comes loaded with a variety of designs and tutorials.The machine has a large 5x7 inch embroidery area. It is portable and incredibly easy to use and manipulate. It features a backlit LCD touch screen display which is great for work done in poorly lit environments and if you have poor eyesight. It comes with a jam-resistant Quick-set drop-in top bobbin and a great memory function. It has an easy-to-see super bright work area and a built-in USB port. The needle threading system of the machine is easy and advanced. If you are new to embroidery, this is a great starter machine for you. The features are quite simple to use, and the machine comes with pre-wound bobbins, LED monitors, Brother memory cards and 200 designs on CD for you to explore your creativity and have unlimited design options. Transferring images from the CD to the machine is a breeze and setting up your machine would an incredibly easy and even fun task with the DZ820E. The machine comes with several accessories such as additional hoops, five bobbins, three needles, scissors, a cleaning brush and dust cover. The screen of the machine is small and monochrome and the machine can only accommodate one type of spool. It is a great option for newbies and anyone picking up embroidery for the first time. Has great functions for beginners. Manual is not easy to follow. Easy to set up and to use. The screen is small. Portable and durable. It can only accommodate one type of spool. Variety of accessories that are very handy. 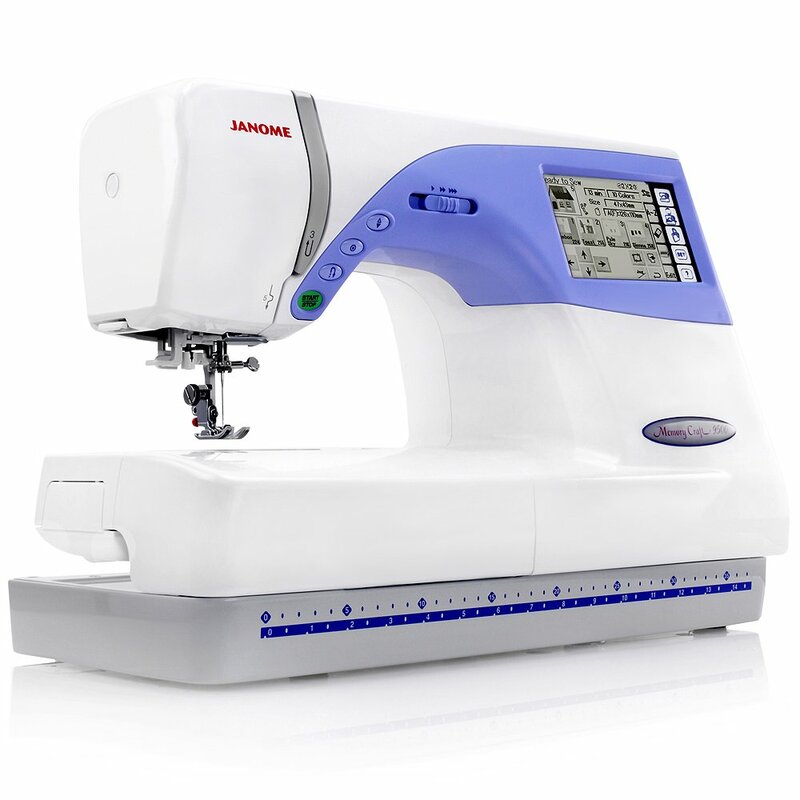 The SE270D performs the dual functions of sewing and embroidery. The machine is easy to set up and comes with a user-friendly, easy to follow and well-illustrated manual to help understand the parts and functions of the device. The embroidery quality of the machine is incredible and makes embroidery easy and efficient. The onboard computer works you through every step and beeps when you make a mistake, and that's just one of the many amazing features of the machine. The computer connectivity feature of the machine helps you to transfer your designs from computer to machine and download, import or purchase new patterns to the machine. The machine comes with several accessories and if you happen to lose or destroy any of the accessories, they are fairly easy to come by and also inexpensive. The machine comes with 97 built-in designs, five built-in embroidery monogram fonts. It also features LCD touch-screen panel for computerized stitch selection and 98 built-in stitch functions. The embroidery area spans a maximum of 4 x 4 inches, and some of the built-in designs include Mickey Mouse and friends’ designs, floral and seasonal themes. The machine features a built-in memory card that's compatible with Disney Embroidery Card Collection, Brothers Embroidery Library, PE-Basic and PE-Design software. The bobbin system comes with a single-step bobbin replace, et which uses the Quick-set drop-in bobbin and an automatic bobbin winder. It features built-in one stop/start and reverses operations which give you the option of using the machine without making use of the foot control. The SE270D features a quick-load thread cassette system, single-step auto-size buttonholes, garment construction stitches, built-in stretch stitches, quilting stitches, decorative stitches and heirloom stitches, the width, length of stitches and thread tension can be adjusted. Some of the accessories included in the package are buttonhole sewing, twin needle stitching, zipper insertion and darning. The SE270D is very affordable for the functions it offers. It's a steal! Dual functionality. The automatic threader doesn’t work. Explore your creative side with the Singer XL-580 Futura machine. Offering a variety of built-in embroidery designs and stitches for your sewing, embroidery, crafting and quilting, this machine is ideally suited to your needs. Sewing and embroidery are hassle-free, fun, efficient and time-saving with this machine whether you are working on a small project or a big one, whether you are a novice or an expert, The XL-580 has got you covered. The machine comes with a whopping 250 built-in embroidery designs, 50 of which are designs you can use for continuous patterns in bedsheets and household linen. The machines also feature built-in stitches with block letters and numbers. The machine features a Long Arm Design which makes working with big fabric easier as of result of ease of movement and a larger space. The work area is equipped with StayBright LED lights which are great for working in poorly lit areas, working at night, or working with poor eyesight. Bonus software AutoPunch and Hyper Front are included in the package making it possible to transform images and fonts to embroidery, and your machine can be connected to the computer using a USB key. The machine comes with editing feature and Advanced Editing software which enables you to change existing embroideries. Its variety of features include the Drop & Sew Bobbin System, SwiftSmart threading system, electronic Thread trimmer, Presser Foot Sensor for quick and easy start, Independent Bobbin Winding system,endless hoop of 6.75 x 4 inches for creating border designs, knee lifter, multi hooping capability, 215 built-in sewing stitches, 6 Automatic one-step buttonholes and 1 endless buttonhole, long arm for sewing quilts and other big projects, quick release lever, USB key, 10 x 6 Embroidery hoop, seven types of feet ; embroidery foot, zipper foot, all-purpose foot, buttonhole foot with underplate, satin stitch foot, blind hem foot and button sewing foot. The machine is made of plastic and metal, weighs 54.6lbs and is 21.5 x 9.5 x 12 inches. The machine is perfect for you whether you are new to embroidery or an old hand. Its features are unique, innovative, enjoyable and useful. It has several built-in design options. It is quite expensive. Dual Functionality. The machine is a bit heavy. Computer connectivity. It does not have LCD screen. Easy to use. It is not handy. This is another wonderful product from Singer that combines the dual functions of sewing and embroidery. The features of the Futura XL-400 are somewhat similar to the features of the XL-850. The machine can be connected to your computer which means you can download/import or purchase designs from your computer directly to the device. You can also upload your designs. The Futura XL-400 is easy to set up and quite easy to use for the novice as well as experts. The well worded and well-illustrated manual makes understanding the parts and functions of the machine a breeze. No part of this machine can be said to be redundant; its design is innovative and incredibly useful. The machine is suitable for home and commercial use and is a great choice for its price range. The XL-400 has some pretty cool features including several built-in embroidery designs and built-in stitches, advanced editing software that helps you to change existing embroideries. For better visibility, the work area is illuminated by six super bright LED lights this enables you to work well at night and in poor lit environments. It has an easy needle threading system and jam-resistant bobbin. It is a slightly smaller machine than its predecessor and quite portable. You can easily create and design your very own embroidery patterns and transfer to the machine using a USB cable. The machine features 125 built-in embroidery designs, 30 built-in sewing stitch options, five stylized fonts and two automatic one-step buttonholes. It comes with a SwiftSmart threading system and a Drop & Sew bobbin system which makes it easy to set up and even faster to operate, saving you lots of precious time. Easy to use. The hoop has only one position. The Janome Memory Craft MC is a great option if you are on the lookout for affordable embroidery machines. It combines the dual functions of sewing and embroidery and features 90 built-in designs and 98 built-in sewing stitches, three built-in embroidery fonts as well as 2 and three letter monograms. You can also combine designs and lettering from your built-in fonts. It is a sophisticated computerized machine that is user-friendly and easy to set up. It features a handy manual that is quite easy to follow. The machine has a large embroidery area of 5.5 x 7.9 inches; it features a drop-in bobbin, free arm, the stitches, both length and width, are adjustable, an adjustable presser foot pressure, adjustable needle position, auto threading. Its back-lit LCD touch screen helps you make decisions about setup and alerts to mistakes made. This machine gives you great quality and value for your money. Specialized embroidery features with sewing machine functions. It cannot be directly connected to your computer. Automatic threading function gives professional finished look to your embroidery. The LCD screen is large for great visibility and allows you to combine and edit designs and letters. It features an assortment of utility stitches for garment construction. When searching for the best sewing machine with embroidery to purchase, you need to consider a lot of things like the Brand. The three top brands that produce quality machines in this industry are Brother and Janome. These brands have built their name to an extent where we expect nothing short of quality machines from them. How you intend to use the unit as well will determine the type that you decide to go for. Some sewing machines are best suited for personal use while some can work long hours without any hassle. These are ideal for commercial purposes. 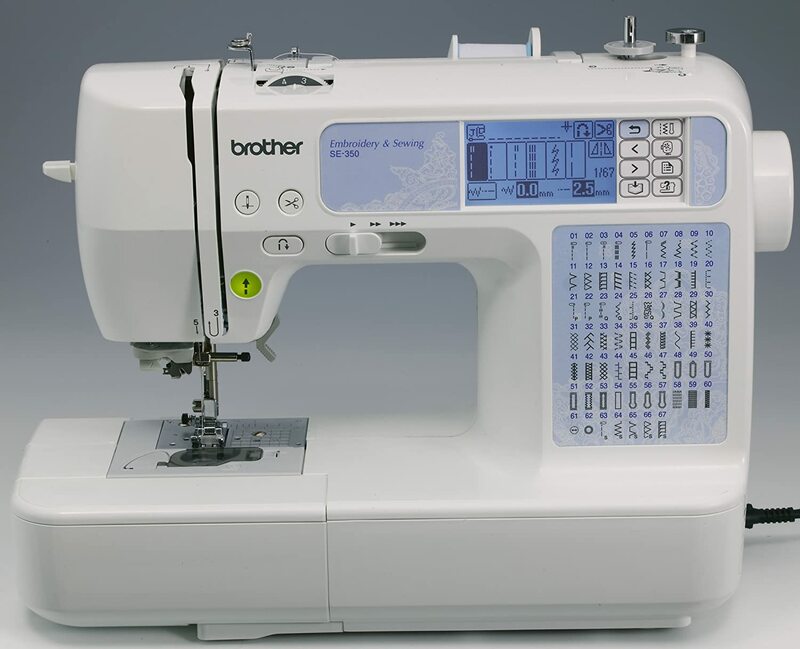 If you are unsure of where to start from for a personal sewing machine, we recommend the Brother SE400 which is a combination of sewing and embroidery machine. It's loaded with all the niceties that make this digital machine a must-have in every home. From an LED display to computer connectivity feature. Professionals love using this machine as well as beginners, who find it easy to set up and handle. However, if you are on the market for a sewing machine for commercial purposes, we recommend the Singer XL-850 Futura Embroidery and Sewing Machine. 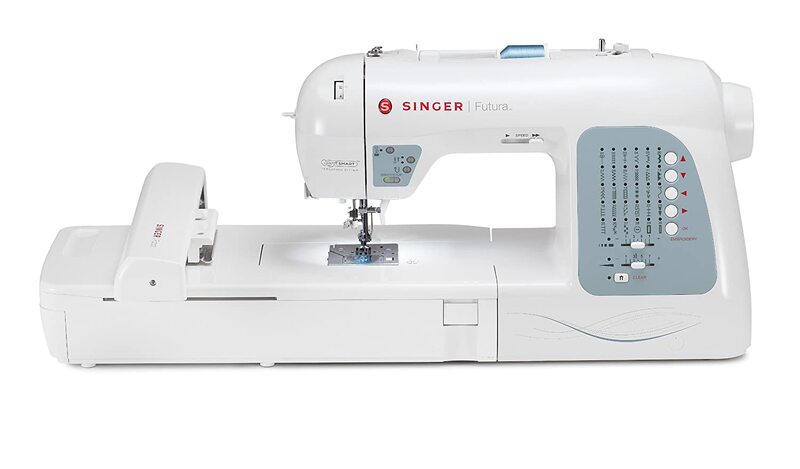 The Singer XL-850 is a beast of a machine that offers a variety of in-built designs and stitches for sewing, crafting and quilting. We love the variety of embroidery designs that can be used with this machine. It comes with over 200 designs that are in-built into the machine for continuous patterns in household linen. Our biggest feature with this machine has to be the Long Arm Design which makes it a bit easier to work with bigger fabric designs thanks to the movement and larger space that it creates.